January was a busy month for our Investigations department and the trend continues as temperatures hover in the sub-zero range. Staff answering calls from the 310-SPCA Report Cruelty line are seeing an influx of reports from concerned citizens reporting dogs being left outside. If it’s too cold for you to stay outside, then it’s too cold for your pets to stay outside! While some pets enjoy the great outdoors, it’s extremely important to ensure they are provided with appropriate outdoor accommodations. Download the Ideal Doghouse Brochure for details. Like humans, dogs are susceptible to hypothermia. Prevention is half the battle. In our Pet Health Corner, Dave Wilson, Director of Shelter Health and Wellness for the Ontario SPCA and retired vet, talks more about how to prevent hypothermia and how to recognize its symptoms. Little “Freddie” was suffering from serious head injuries when he was rescued by the Ontario SPCA. Thanks to the support of caring people like you, Freddie was able to get the care and rehabilitation he needed for a second chance at happiness. Donations and participation in events like the upcoming National Cupcake Day™ on February 29th, helped Freddie get the surgery he needed to live a happy, healthy life with his new family. You can help other animals like Freddie get their second chance by joining this year’s Cupcake Day and baking cupcakes for family, friends and coworkers. Register today at nationalcupcakeday.ca and help save animals’ lives. A special thanks to our National Cupcake Day sponsors for their commitment to Animal Welfare: Pets Plus Us, BMO, Hills, Agency 59 and Used.ca. 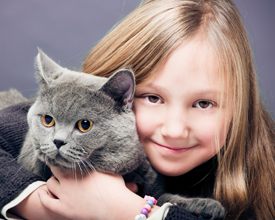 The Ontario SPCA is pleased to partner with the City of Markham to offer Adoption Services and Humane Education programs to the community with the opening of the new Markham Cat Adoption & Education Centre (CAEC) located in the Thornhill Community Centre. 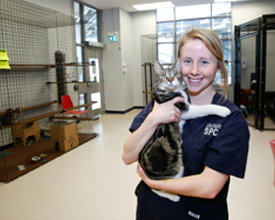 CAEC is the first of its kind, funded by the municipality and operated by the Ontario SPCA, with the goal of finding more cats forever homes and provide education services to enhance pet care. Does your pet have a microchip? Each year thousands of lost and abandoned animals are taken in by shelters across the province. Some of these animals never make it home because they can’t be identified. Microchipping can provide the only truly permanent method of identifying your pet and linking the animal back to you. Collar tags can break or become unreadable and tattooing can become illegible. So, if you want to improve your pet’s chances of getting home fast and safe in case it were to go missing, microchipping is your best option. Are your pets included in your Family Day activities? Whether you’re snuggling up with your pets in front of the TV, or spending the day away visiting family, we hope you and your pets enjoy the day. If you’re travelling with your pets, check out the fact sheet on Travelling Safely with Your Pet to help make the most of your trip. Every morning and every night, we humans spend time taking care of our teeth. But what about our pets? How can their teeth and gums stay healthy if we don’t give them the same care? February is Pet Dental Health Month! 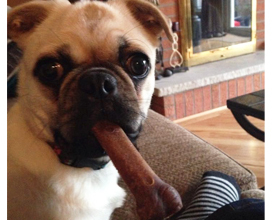 To help our pets maintain dental health, we explore the five W’s of good oral care for pets.